A total of nine semi-structured interviews were carried out between November 2013 and April 2014 with senior lawyers specialising in asylum and immigration law in the United Kingdom and Sweden enquiring into their perspectives and practice around the issue of environmentally related cross border displacement. 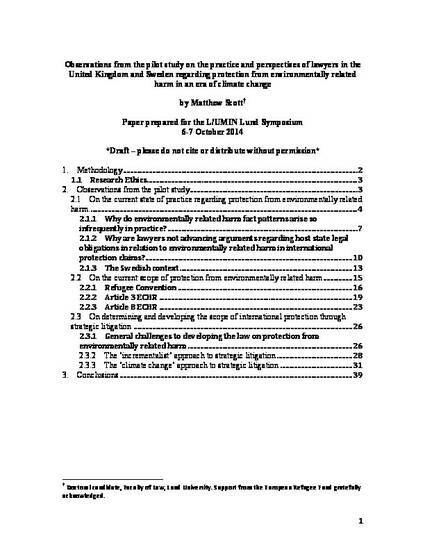 The pilot study suggests that lawyers in Sweden and the United Kingdom are not routinely involved in seeking international protection for individuals who may be at risk of being exposed to environmentally related harm if returned to their countries of origin or habitual residence, although some 'pathways to protection' were identified. I suggest that lawyers themselves may compound the protection gap in the positive law by failing to identify cases where protection from environmentally related harm could be available. If the risk of environmentally-related harm is not explored in practice, the opportunity for determining and potentially developing the scope of protection through litigation may be missed.